It’s nice being retired because you can host a get together anytime of the day! So 2/22 at 2 p.m. was the perfect time. Can’t go wrong with all 2’s. Ended up with 7 variations of margaritas. From Kiwi, which was green and I do not drink green drinks! But it must have been the Tequila, because it was very tasty! We had a fresh Pineapple margarita version that was pretty good too. There was a Mango Margarita that I think might have really been a Tequila Margarita with a splash of Mango….super good. I am not a beer drinker but the Strawberry Beer Margarita was also good – no beer taste at all. And the Watermelon Jalapeno Margarita I couldn’t taste because of the Jalapeno’s; but those that tasted it said it was refreshing! And what do you end up with, a Dessert Margarita – Coffee, Bailey’s, Ice Cream – made one batch with no tequila (was good) but the second batch with Tequila was even better. Ended up with 13 people and from what I’m hearing everyone enjoyed it! 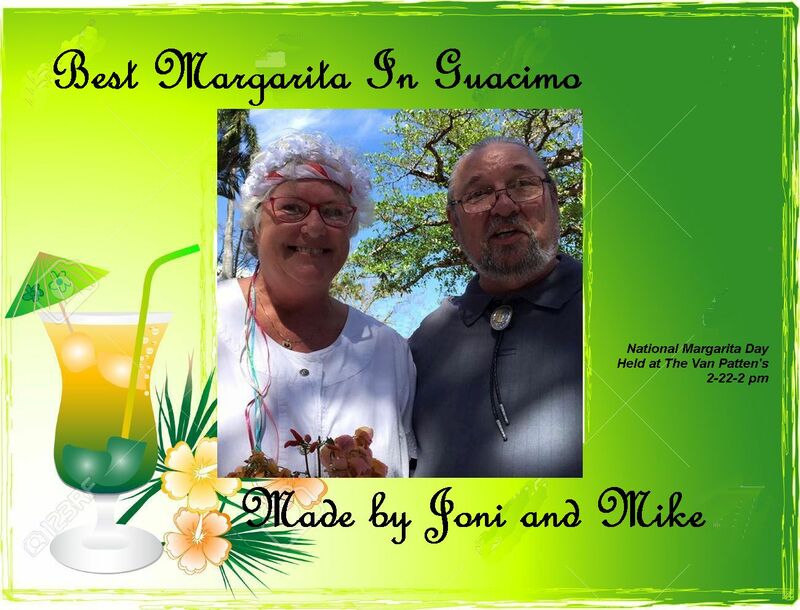 I know Mark and I had a great time – and even better, no headaches this morning after mixing all of the different Margaritas! I have ended up with a large green bowl that had guacamole in it – let me know who’s it is. And we’ve already found the owner of the hat, which will be returned tomorrow! All in all it was a great time….small group, am beginning to think small groups are better because you get to talk to everyone! So Happy National Margarita Day yesterday to everyone! Mark needed some meds from CAJA today. I needed mine from the farmacia. So he dropped his info off at CAJA and I said I would walk there. He called to tell me that Don Luis was not working today! I said I’ll be right there. Of course there was a line; a long line; lots of Ticas getting paperwork to fill out. Finally, when it was my turn, I just said that my dates needed to match my cedula! Voila…..she looked at me and smiled and then printed out a new one so now I have 2 years on it! And now, I am woman hear me roar has ended. Short book only two chapters!